Works great on plastics, trim, door panels, etc. The SONAX Multi-Purpose Auto Interior Cleaner is a great cleaner for the interior that helps you safely clean fabrics like carpets, mats, cloth seats, doors, plastics, trim, etc. The formula was formerly known as the SONAX Upholstery and Carpet Cleaner but really it's much more versatile. It's an environmentally responsible product that neutralizes odors and deep cleans all fabrics and most of your interior with ease. Spray stains directly and mist it over the rest of the fabric to start breaking up dirt, dust, grease, oils, and other stains. The surfactants and foaming action of this cleaner release contaminants and forces them to the surface for removal. You can agitate the fabrics with a brush or just vacuum the area to make the carpets look and feel like new again. Best of all it doesn't just mask odors it kills them at their source. Afterward the pleasant scent left behind makes getting in to your car even more enjoyable! SONAX Upholstery & Carpet Cleaner gently and thoroughly removes stubborn dirt and stains from fabrics, upholstery, door panels, carpets and ceilings. The foaming action formula is rich in cleaning agents (surfactants) that bond to foreign contaminants deep within the fibers, leaving behind a clean, fresh scent. DIRECTIONS FOR USE: Vacuum area first to remove loose dirt. Spray SONAX Upholstery & Carpet Cleaner directly on stains or areas to be treated. Use damp sponge or cloth to gently agitate stubborn dirt. Wipe off with a moist, clean cloth and leave to dry. PLEASE NOTE: Protect against frost or freezing. To avoid differences in colour and brightness between treated and untreated areas, always apply onto the entire surface. I really like this uphostery cleaner. I use it to clean cloth seats. 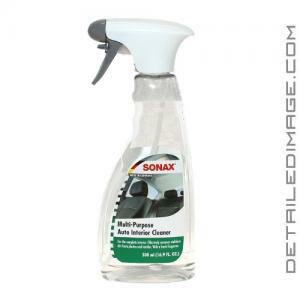 I bought it after reading other reviews about how good SONAX products were. I am SO GLAD that I bought this product. It is very good quality and I really nice the smell which I can only describe as "fresh" smelling. Its not really a chemical smell, but a fresh and clean smell. This will probably be my "go to" carpet and upholstery cleaner from now on. How I use this is spray the seats I am cleaning, use my uphostery brush and scrub the surface and then follow up with a bissel "little green clean machine" which is not a good quality extractor, but it works for a weekend enthusiast like myself. I just make sure the green machine cleaning solution (mixed with a little Sonax carpet cleaner) is nice and HOT and it really works well cleaning any cloth seats or carpeting in the vehicle I am cleaning. This is a high quality product. It's a little pricey compared to stuff you can buy at your typical auto parts store, but it is WELL WORTH THE EXTRA COST. You pay a little more now, but you get quality product and you aren't wasting your money on less quality products. This is definitely worth the price you pay. A light misting on the cloth surface works. You don't have to "soak" the surface so your bottle should last through several vehicles with cloth upholstery and carpeting. This is probably one of the most effective upholstery cleaners on the market. I prefer this type of product because it doesn't require the upholstery to be completely soaked in order to remove a spot or stain. It also seems to revive the fibers in carpet and floor mats. It's been great using this product to clean the salt out of upholstery. If you're detailing high end vehicles or delicate interiors, i would recommend this product as it works quickly, effectively and safely. Another amazing Sonax product... This upholstery cleaner works just as advertised. It softens the soiled spots on the carpet and then wipes up effortlessly. I used 2 black all purpose towels for use. 1 slightly dampened and 1 dry towel. The thing I noticed right away was how concentrated the product is. It took 3 sprays to remove a dried syrup like stain on the carpet. Like I stated, it softened up the dried product and lifted it up and removed it. with very little agitation. The product also is stated to be an odor eliminator. And I found this to be true. It leaves an amazing citrus like scent that IMO is amazing. For comparison purposes the products I use on carpet are 303 carpet spot remover, Ultima interior shampoo and Blackfire interior cleaner. Those product have worked well for me. BUT this Sonax product is easily more effective. It works a LOT faster (basically no dwell time), with less product (more concentrated), cleans up easier and to top it off is an odor eliminator that smells better than those other 2 products listed. I was so impressed with this product that I just ran into the house to write this review before I forgot the specific details of what I though about it. All while in the middle of a detail. I am that impressed. I would highly suggest that everyone who see's this review gives it a try. If you use the products that I have listed I am very confident that you will feel similar how I do about this. I will keep on supporting you guys, amazing customer service and fast shipping! Thanks a lot!